I always like experimenting with my diet and seeing how it effects me. I was in Toronto for a few days last week and I thought it would be a fun try my first juice cleanse. I've always been curious about them, though a bit skeptical. As I am both juicer-less and lazy, I decided to splurge on a prepared juice cleanse from my favourite raw restaurant in Toronto—Live Food Bar. 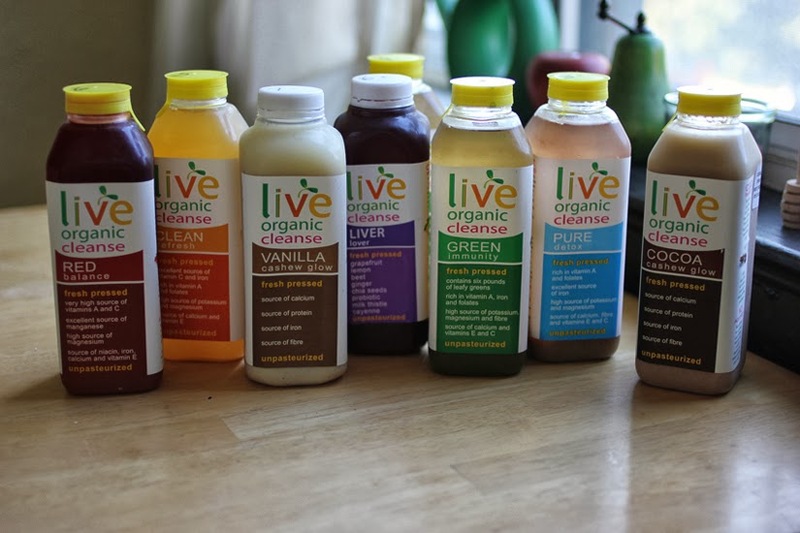 I was already familiar with their juices and love them, so I kind of thought the cleanse would feel like a treat...an off-the-hook, unlimited juice party. I committed to three days of nothing but juice, drinking 6 juices a day (delicious) in addition to a morning elixir (gross). I cheated once and bought an extra juice...I also drank my fair share of coconut water, but aside from that, I stuck it out. Physically, I really didn't feel...much. Actually, I was surprised because I was rarely hungry. I never felt full, but there weren't any "my stomach is eating itself" hunger pains. I felt light and fairly normal, though a bit tired. I was also fairly emotional during the cleanse, but some of these symptoms could easily be attributed to external events. Oh, and I also had to pee all the time. The mental component of the cleanse was most difficult...knowing I couldn't eat anything made me obsessed with wanting to eat something. I don't think the urge would have been so prominent if I had not been visiting Toronto, where I have a kitchen and access to my favourite restaurants. Had I done the cleanse back in Muskoka, I think I would have been ok, as I don't cook or eat out much. Juice would have been a welcome change to salad. Post-cleanse, I feel good. Really good, actually. Kind of like I'm re-set. Nothing major, just a general good feeling. I'd do it again...during a calmer time in my life, and perhaps for a longer period of time. I'd like to see if anything becomes more marked as time goes on, though I don't know if I could make it a full week. I love food. I've always wanted to do one but I also don't have a juicer and prepared juices are so expensive. Maybe now that I'm making a real salary I'll do it! Off the hooooook. I've also always been curious about them. I feel like I'd cave so easily though, haha. Its nice to hear that you were happy with the results!